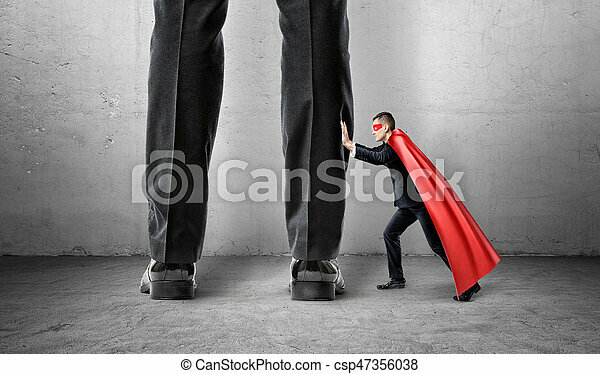 A small businessman in a superman cape trying to push away giant man legs. uneven competition. best performance. business problems. 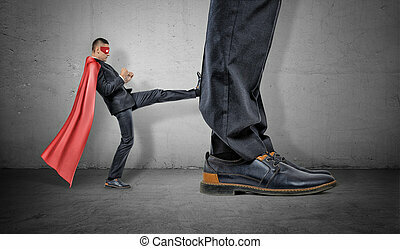 A Small Businessman In A Superman Cape Trying To Push Away Giant Man Legs. 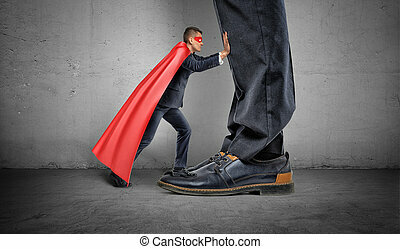 A small businessman in a superhero cape trying to push away giant man legs. Uneven competition. Best performance. Business problems. 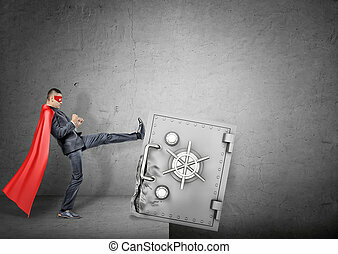 A businessman in a red superhero cape kicking at a giant strongbox to push it over the edge. Business and investment. 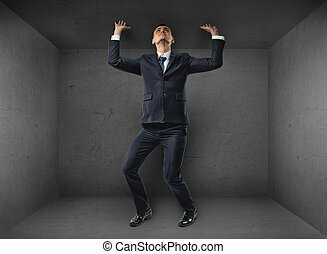 Banking disadvantages. Business reliability. 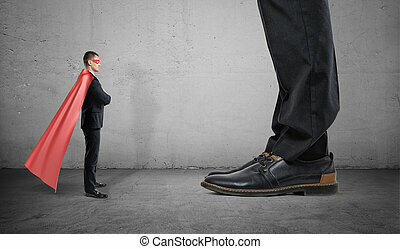 A tiny businessman in a superhero cape stands facing giant man with only his feet seen. Business competitors. Small and big companies. Monopolistic market. 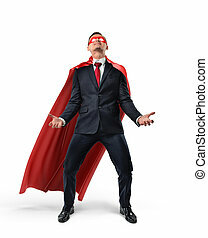 A businessman wearing superman cape and mask trying to lift up an invisible object from below. Business and success. Obligations and burdens. Hard work. 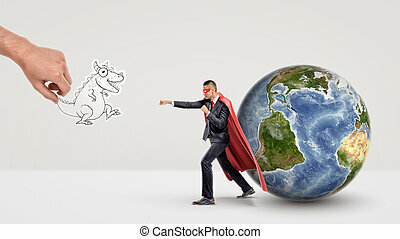 A small businessman in superhero cape beside a globe ready to fight off a paper dragon held by a giant hand. International business. Fighting off competitors. Hero and dragon. 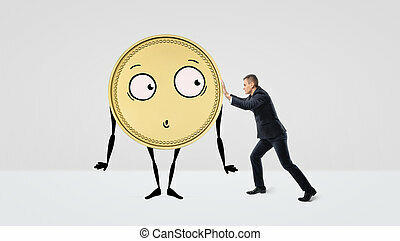 A businessman trying to push a golden coin with arms, legs and a face on white background. Business and profit. Earnings. Smart investment. 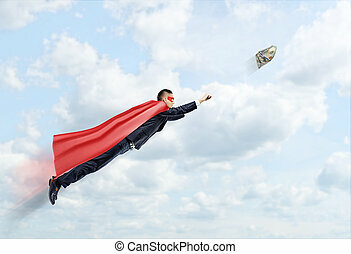 A businessman in a superhero cape flying in the sky trying to catch a 100 USD banknote. Business aspirations. Impossible effort. Fortune and profit. 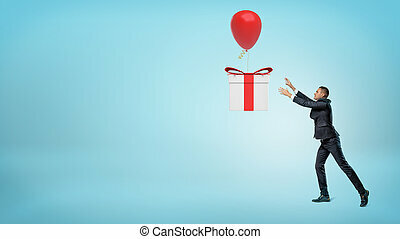 A small businessman trying to catch a big gift box that is flying away on a balloon. Gifts and presents. Sales and promotions. Business aspirations. 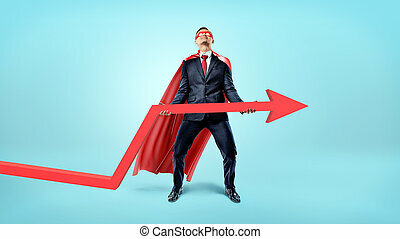 A businessman in a red flowing cape trying to lift a large red arrow upwards on blue background. Investment and banks. Business profit. Stock index. 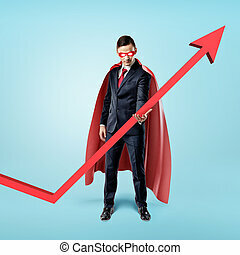 A businessman in a red flowing cape trying to keep the upward looking red arrow with his hand. Investment and money. Stock index. Growing market. 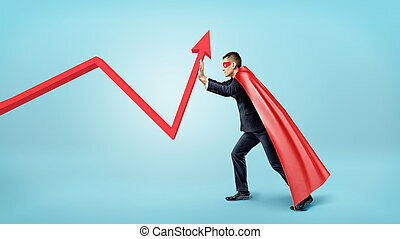 A businessman in a red flowing cape trying to bend a red statistic arrow upwards on blue background. Accounting and finance. Business and investment. Profit and loss. A businessman in a flowing red cape holding hummer. Moving forward. Business and success. Growth and competition. 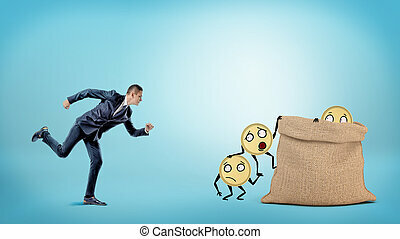 A small businessman running to a large full sack where many coins with arms and legs are getting in. Know where money are. Wise banking. Profitable investment. 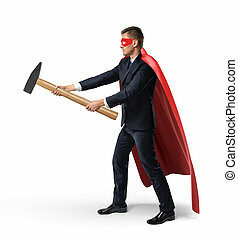 A tiny businessman in a red cape and an eyemask kicking at a retreating giant foot. Market players. Small and big companies. Workplace competition.